I've attended to 5 YES (and A.B.W.H,) gigs. - The Teatro Lirico acoustics was the best one I found in an avenue. - I met casually Squire and Sherwood in the "Duomo square", Milan , in the afternoon and I chetted with Chris for 3-4 minutes. Music was amazingly played ... I was sitting just at the 14th row in front of the stage. Howe played the long tracks sitting also on a bar-chair placed on the stage. It was probabily the best concert I've attended in my life. Outside the theatre (before the gig) I also had a chance to get signatures from Squire, Sherwood and White. As Jon Anderson once said while introducing And You and I, good music is just like good wine: it gets better with age. After my fifth Yes concert in 21 years, I feel that he is right. We will certainly find critics that will say that Yes music is jurassic, but it's absolutely easy no to care. The Milano Show has been simply great. As my personal experience goes, it matches the Going for the One tour and beats all the others. It was a night of shivers and joy. I heard several people commenting. "Much better than Genesis last month". How could I contradict them? I have a friend who saw Yes at the The Lirico in 1971 (10th may) and keeps wonderful memories of the event. Twenty seven years later, we found the same strenght both in the players and in the audience, which greeted the band with an unusual (for Italy) early sold out. By the way, two track survived the years from those days: All good people and America. As we get to accept the passage of time, there we find the pleasures of those things which are powerful enough to survive. Yes is one of those pleasures. First turn of introductions. Jon presents Sherwood by playing Happy Birthday. Laughs. We all sing and this helps to find out that just few people know his first name. Open Your Eyes is alright, with a slightly different coda. 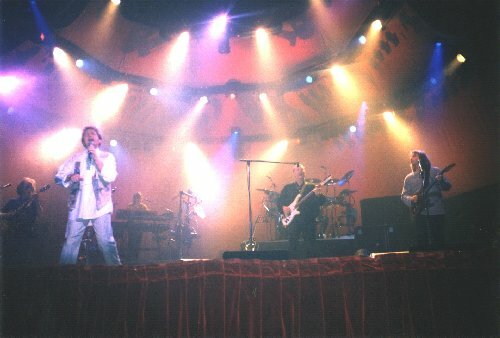 The combination of And You and I (written during a "Tea party" in which it seems form Jon's words they were smoking "tea") and Heart of The Sunrise is explosive, the Yes Orchestra at his best. Howe is the man of the moment, even if Squire does a lot of magnificent work in the background. Standing ovation. Jon's voice seems a little less powerful that it use to be. Steve drives us in the first solo section (dedicated to Chet Atkins) and then to From The Balcony, a moment to take a deep breath. Wondrous Stories is for Jon's wife: he remembers his honeymoon in Italy when in visited Milan and the South. This being Florence and Assisi, 200 miles before the North of the real South begins!!! The Khorsehev solo is ok, but Long distance Runaround and The Fish is better. During the bass solo Squire plays the main riff from Arriving Ufo and some bits from Ritual. The drum solo is solid. Alan White is a very strong musician, not as technical as Bruford, but with a greater capacity of expression. The drums are warm, the sound is deeper. There's more heart in it. Here we must said that the Pa is working like a clockwork: the sound is nearly perfect. Owner of a Lonely Heart recalls the fm days. Sherwood does the Rabin, and Howe palys a new solo on a new coda. Revealing is the moment I was waiting for, being Tales one of my favourite albums. More over I had never heard it live on stage before. The devolping of a 20 minutes music piece is something astonishing in a live performance. I'd like to know wether it is has been tougher to compose or it is more tough to be played. "I must have waited all my life for this moment" is quite the key phrase of the night. Standing ovation. THE SETLIST : very "nostalgic" but absolutely good! THE SOUND: good, powerful but strangely "DRY".....: no reverbs and delays on vocals and you can imagine the beginning of "Revealing science" without reverb ???? WHY, mister sound engineer ???? MR. ANDERSON: perfect, very nice. MR. HOWE: ever the same ! MR SQUIRE: a real showman, a real sorcerer, the hero for every fan in the crowd !!!!! ........but the look......AAAAAAARGHHHHH!!! MR. IGOR THE RUSSIAN: very very very gooooooood!!! great impact, really "in sound" , perfect soundpatches, right attitude: Why he is'nt in the official member list ????? MR. BILLY "silly" SHERWOOD: WHY HE IS IN THE OFFICIAL MEMBER LIST ???? Guitar playing: not audible Singing: where audible, horrible !!!! A dead man non-walking on the stage !!! MR. ALAN WHITE: with a compact drumset, what a powerful impact !!! In conclusion, a good performance with some " ??????" !